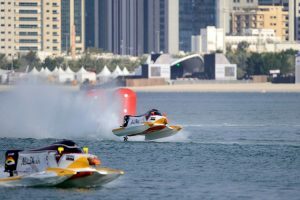 Formula 1 boat racing is a fun water sport that guarantees players and onlookers an adrenaline rush. While the event may not be as popular as F1 car racing, thousands of adoring fans show up at boat racing venues every time. After all, it is hard to believe that a vessel can move from 0 to 100km/h in two seconds until you see it. The sport is popularly known as F1H20 since the Union Internationale Motonautique (UIM) organizes the event, and H20 racing handles promotion. It goes down in different locations around the world every other month. And most of them happen on open water as its unpredictable nature adds an edge to the whole thing. However, there is also a little something for the inland folks that would like to see some freshwater action. F1 powerboats come with Mercury V6 engines that burn 100LL Avgass at the rate of 120L per hour. The result? A whopping 450 horsepower at 10,500rpm. That fine-tuned power propels the watercraft to a maximum speed of 250km/h. But that’s not the most exciting part, these babies don’t come with a braking system nor do they have a gearbox. So it would be okay to say that this sport is not for the faint-hearted. The F1 boat design has not changed much since the 1970s. They still have the aerodynamic tunnel hull catamarans that make the vessel easy to control even at top speeds. They weigh a total of 390kg, most of which comes from the engine. And they are typically six meters long and two meters wide. The boat’s body is made of carbon fiber and Kevlar as they are lightweight but still robust enough to withstand minor crashes. However, that has also worked against the design since the halls tend to pierce through the opponent’s body in case of a collision. When it comes to safety, these powerboats have borrowed quite a few features from the car industry as well as the aviation sector. Here, we are talking about safety belts, driver cages, airbags, and a crash box. That coupled with life jackets and helmets, goes a long way in improving the safety standards in boat racing. Overall, this sport makes those F1 cars look sluggish. Nothing beats the wake that these vessels leave behind as they take off. Or the feeling that comes when you spot the first boat approaching the finish line – it’s just magical.